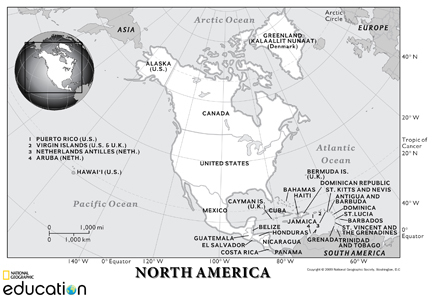 North America is a continent wholly within the western and northern hemispheres. It is also considered a northern subcontinent of the Americas. North America covers about 4.8% of the planet's surface or about 16.5% of its land area. It is the third-largest continent in area, following Asia and Africa, and the fourth in population after Asia, Africa, and Europe. It is bordered on the north by the Arctic Ocean, on the east by the North Atlantic Ocean, on the south and southeast by South America and the Caribbean Sea, and on the west by the North Pacific Ocean. North America includes Canada, the United States, and Mexico, as well as the world’s largest island, Greenland. The Rocky Mountains form the backbone of the continent running from Alaska to New Mexico. In the East are the Appalachian Mountains, flanked by coastal lowlands to the east and south. In eastern Canada lies the Canadian Shield, a huge basin of ancient eroded rocks. Deserts stretch from the southwestern United States down into northern Mexico. The American Indian archaeological record is one of the richest in the world. There are numerous American Indian sites in the Southwest that are still remarkably preserved. Some of these ancient settlements and cultural sites of the continent are identifiable by great mounds, cliff dwellings, petroglyphs, and remnants of ancient villages. Fortunately, there are a number of well preserved ancient Native American sites in the southeast and eastern parts of the country to explore. Mesoamerican ancient architecture shows high levels of technological evolution are marked by monumental constructions in the form of public, ceremonial and urban monumental buildings, and structures. 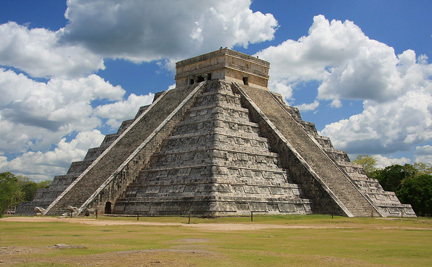 These ancient sites include stone carvings, remnants of pyramids, temples, and ancient cities that are still preserved. Some of the most famous ancient archeological sites include Chichén Itzá, Teotihuacán, and Uxmal in Mexico, Chaco Canyon and Mesa Verde in the United States. Thus, American Indian and Mesoamerican ancient historic and archeological sites are great destinations provide a great opportunity for all travelers who want to understand more about these ancient civilizations!